Let’s face it. No one should ever judge a gift (although most of us tend to do so), but the bottom line is there are varying degrees of gift giving. Some of them are timeless, others we eat, and let’s be honest here, some of them are straight-up regifted. But every once in a while you’ll get a gift that will change your life, and that’s what happened to Rudy Gonzalez and his son, Mark. In the grand scheme of things most of us would be flabbergasted to get some car parts, but Rudy and Mark got something much bigger—an entire car. It was a 1953 Bel Air that was gifted to them by a good friend. “He had originally purchased the car to build it as a hot rod but wound up not going through with it,” Rudy says. 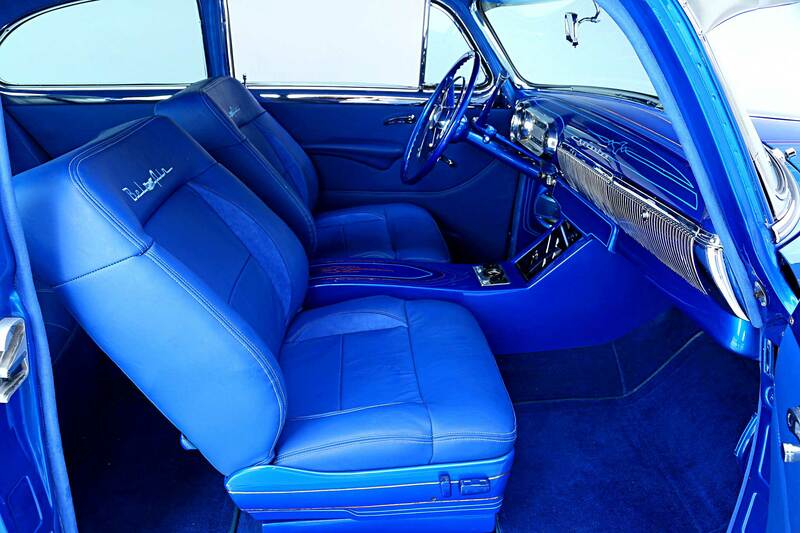 By the time the car dropped off, what they saw was a Bel Air that was in the beginning stages of a full restoration. It was complete, but with other cars already in the works, Rudy had no choice but to throw it in the backyard. 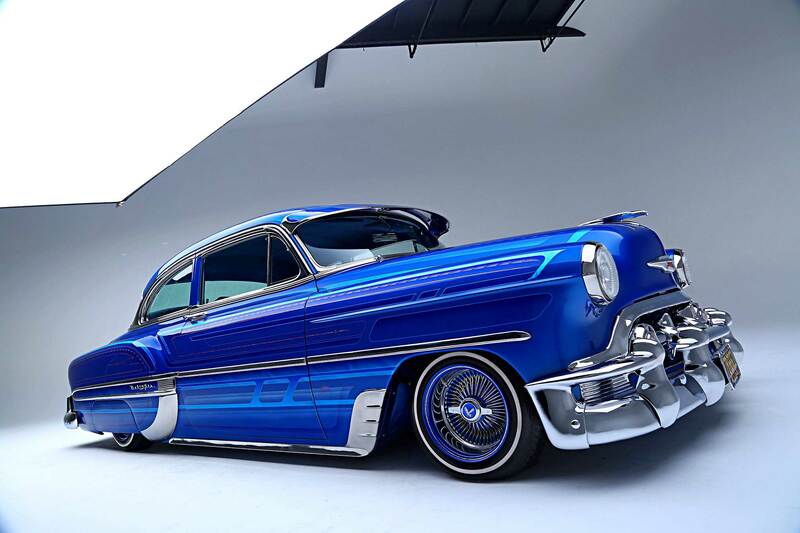 As years passed, Rudy sold his 1951 Chevy DeLuxe, thus giving him room in the garage to push the Bel Air in. With plans to go back to full-original, he soon realized that semi-custom was more his speed. 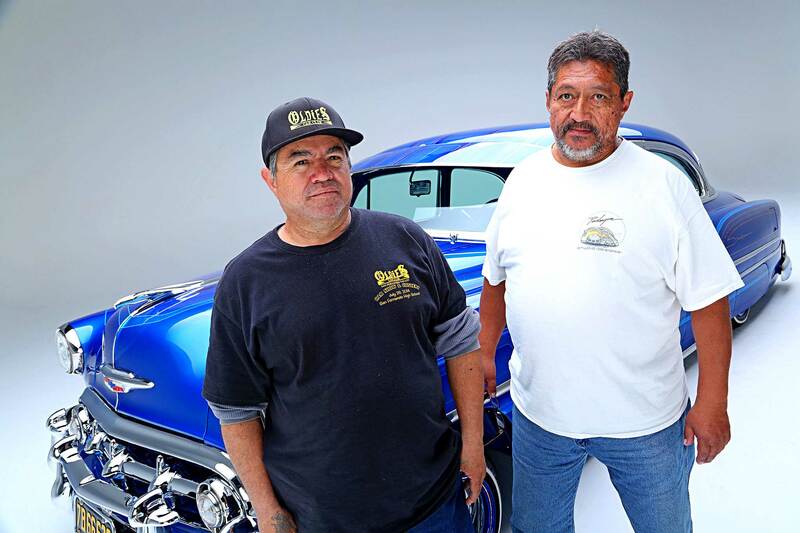 As a painter, Rudy prepped the body of the Bel Air and with the help of his friend, Ernie, they began laying the candy paint once the body was straightened. 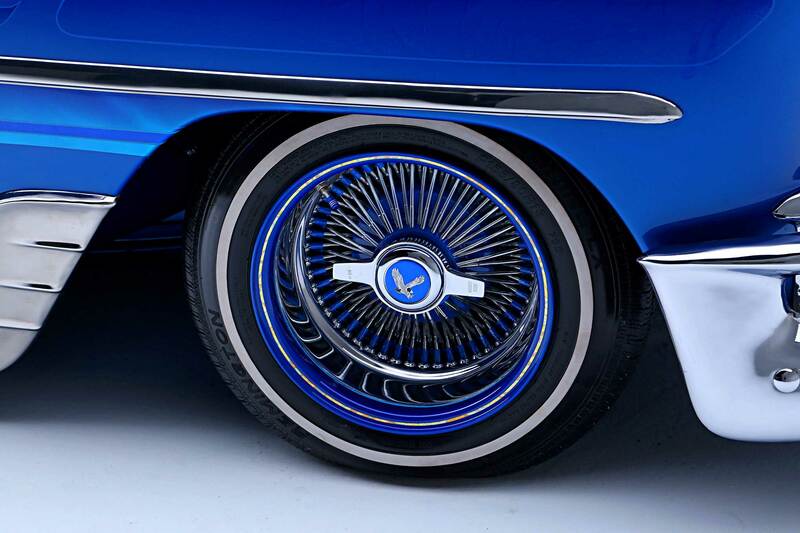 They used other candy blues to lay out a fade, water drops, and marbleized patterns throughout the car. Accenting the exterior skins is a multitude of work, including pinstriping and gold leafing done by both Steve Demand and Tipettes. 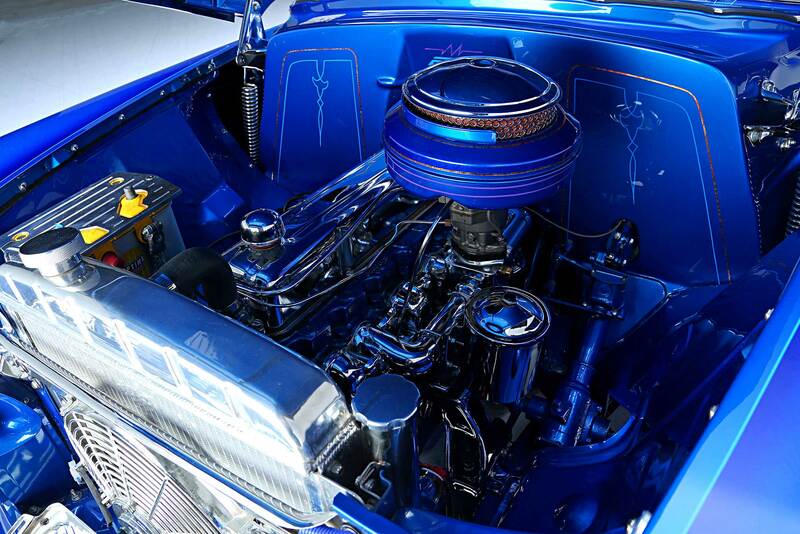 With the body and paint complete, Rudy moved onto rebuilding the engine with Mark. They kept the engine original but paid heavy attention to the casing of the motor, which was either dipped in chrome or painted in candy. 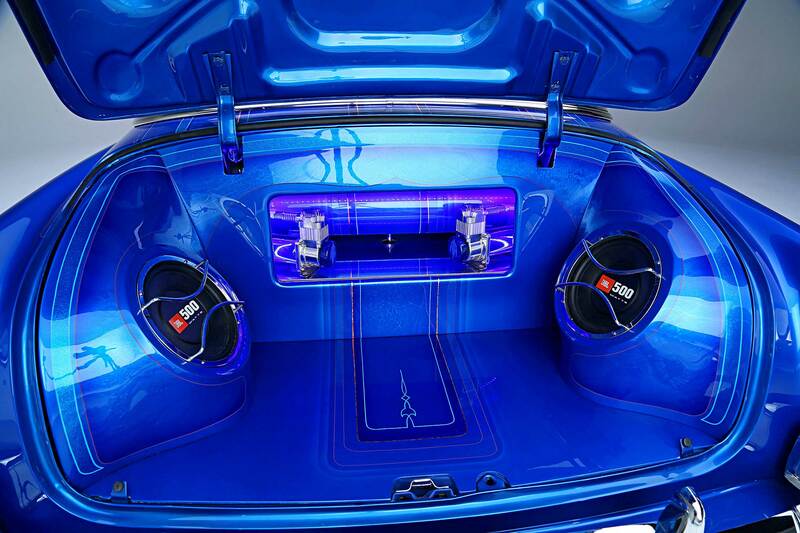 Mark then installed the sound system and airbag setup before it went out to Carlos Custom Upholstery for a blue leather interior. In the end, this 3 and 1/2-year project is complete and has even earned a permanent spot inside the garage while Rudy decides what to work on next. Of course, these are great problems to have and we can’t wait to see what comes next. We’ll keep you posted!